A bright pop of colour in any pencil case, the Red Recycled Plastic Ruler is an essential tool. Suitable for both professional and educational environments, it has been manufactured from a durable recycled plastic. In doing so, it helps to minimise the users impact on the environment while allowing the ruler to be re-recycled at the end of it's life. The plastic also affords the ruler a slight flex and a perfectly smooth design - guaranteeing accurate measurements and perfectly straight lines. To ensure everyone can take measurements easily, the line and number markers have been printed in a clear, legible white font. When used against standard paper, the red and white colour pallet stands out clearly and ensures you are able to complete the job to the highest standard. Rounded corners reduce the risk of injury and a clear recycled logo ensures it ends up in the right refuse location at the end. This 15cm ruler has a compact design that sits within standard pencil cases, pockets or briefcases, depending on your needs. It can be used to return measurements in millimetres, centimetres or inches - each of which are easily recorded through the traditional method. Whether destined for a school, office or personal use, these rulers for an essential part of your stationery staples. 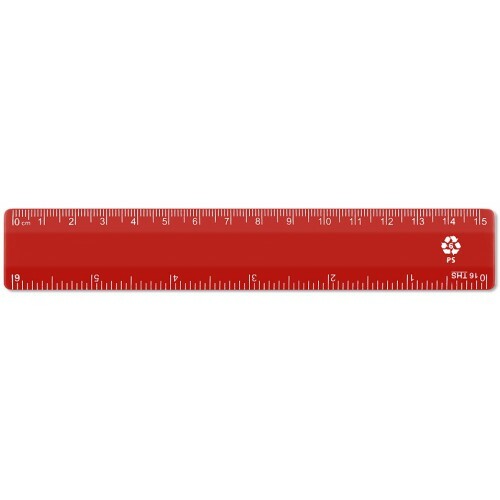 As part of our bulk purchase offer, this ruler can be structured to suit your budget. For orders over 10, each item will incur a price of just £0.22. For orders over 100, each item will incur a price of just £0.16.